We have been asked many times to produce a cab-ride programme and here it is! 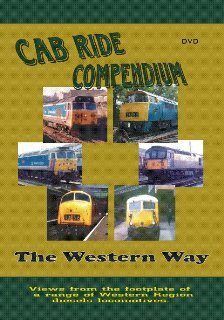 Rather than concentrate on just one journey we have put together a fantastic compilation of no less than SIX trips on the footplate spanning a period of 30 years. Exeter St Davids on 23 June 1991 and we climb up front in the cab of 50018 RESOLUTION as far as Salisbury as it departs with a Waterloo service. Not only that but we have 50049 DEFIANCE coupled behind so with more than 5000 bhp on the rails we won't be hanging about. Network South-East liveried Brush type 4 No 47573 is our steed as we depart from Plymouth for Newton Abbot on 18 December 1988. ABSOLUTELY CLASSIC Western Region traction is evident in this section as we travel the whole route from Bury to Rawtenstall on the East Lancs Railway in the cab of D832 ONSLAUGHT. As a comparison we take a short ride in the cab of D1013 WESTERN RANGER as it tackles Eardington bank on the Severn Valley Railway. Ride is in the cab of the Blue Pullman on the Bristol to Bath section in the 1970s. Finally, double-headed Cromptons feature, as we ride from Exeter Riverside with 33108 (paired with 33114) on 7V84 Eastleigh to Meldon Quarry consisting of 20 spoil wagons on 14 September 1990. Of which were recorded on the BR network, and the remaining two in more recent years on preserved lines. The earliest scenes feature ‘Blue Pullman’ sets, seen from the lineside in the two main livery variations, and brief edited film shot in the cab between Bristol Temple Meads and Bath Spa. The first of two sequences from the NSE era puts us in the cab of 47573 The London Standard climbing the Devon banks between Plymouth and Newton Abbot in December 1988. The second sequence from this era features a brace of Class 50s, No 50018 Resolution + 50049 Defiance working in multiple forming the 1622 Exeter St Davids-Waterloo during June 1991, in what can only be described as an enthusiastic run! They obviously had no trouble climbing the steep grade between Exeter St Davids and Exeter Central stations then, once past Exmouth Junction, you feel the need to hold onto your seat while the pair power towards the capital. By the time you reach Salisbury, where our filmed journey ends as No 50018 is removed to be stabled in the bay, you feel ready to stretch your legs! On the way you can but despair of the short-sighted decision to ‘rationalise’ the former L&SWR line when the WR took control of this route. Making a change from these passenger operations, how about a run from Exeter Riverside up to Meldon Quarry with a pair of ‘Cromptons’? Nos. 33108+33114 have charge of 7V84 Eastleigh-Meldon comprising 20 empty spoil wagons in September 1990. The 33s rattle along the Barnstaple branch to Crediton, where the two routes diverge, at first running parallel, before out train climbs up the former L&SWR main line through closed stations which form part of today’s heritage route centred on Okehampton station. More recent footage has an all-too brief burst with D1013 Western Ranger at Eardington on the Severn Valley Railway, and a full trip from Bury Bolton Street to Rawtenstall on the East Lancashire Railway in the cab of D832 Onslaught. The latter obviously features far better camerawork than the archive sequences, though personally I must admit to really enjoying the amateur footage offering a welcome insight into the former BR operations and how it used to be.